I've been playing around a bit with Google Maps and decided to mark up some points of interests on the Kola Peninsula for my students to explore before our excursion there in October. You can make out the piers of the naval bases of the Northern Fleet, and environmental damage from the nickel smelters in Nikel and Monchegorsk. Probably the coolest site are the secret early warning radar station and the huge surface-to-air missile base on the way to Lovozero. You can see my marked-up Google Map either here at NorthSpace, or the "official" version at the Arctic Centre. Let me know if you find any mistakes, or new interesting features. Posted on September 11, 2005 by Scott Forrest and filed under Academic, North, Travel. I hope Jay still thinks this is as cool as I do. I spent last week on a tour of the Kola Peninsula, leading a group of international students. While we were in Murmansk we somehow managed to get access to the very-off-limits Atomflot base to take a tour of a nuclear icebreaker. 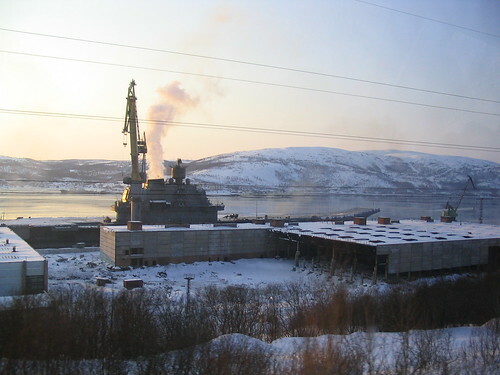 As we arrived at the base, I suddenly saw the Admiral Kuznyetsov, Russia's only remaining aircraft carrier loom into view. I snapped a quick photo from the bus, but we were strictly forbidden from taking photos inside the base where we were barely 50 meters from the behemoth. Nevertheless, I took a spyshot out the window of the window of the icebreaker towards the Lotta, a floating base for spent nuclear fuel from submarines and icebreakers, and the surrounding storage area. You can check out all the photos from the trip in PhotoSpace. Posted on March 20, 2005 by Scott Forrest and filed under Academic, North, Travel. I've registered a new personal web domain, ScottForrest.name, which I'm going to use for my academic/professional profile. Basically, it's a page I can link to in my conference publications, and from the Arctic Centre page, so that my colleagues in the scientific community don't find out what a raging freak and geek I am (well, at least not right away). For those of you who frequent this site, you already know what a head case I am, and there's really nothing that interesting on the new site. Very boring. Don't go there. Really. Posted on November 12, 2004 by Scott Forrest and filed under Academic. I returned this week from an excursion to the Kola Peninsula with the Northern Resources masters program. I was the excursion's "academic coordinator," which basically amounted to me giving short background information on the various environmental disasters they would be seeing each day. And believe me, the Kola region has plenty to offer in that area. Nevermind the 200+ nuclear reactors, most of which are in out of service submarines, some in various states of being decommissioned. Or the Pechenganikel and Severonikel smelting operations that collectively pump something like 450,000 tons of SO2 plus assorted heavy metals annually into the air, resulting in massive forest devastation in the surrounding areas. Or the Kola Nuclear Power Plant, for which Bellona claims a 25% chance of meltdown on the two oldest reactors over their 23-year lifespan (these reactors are now 30 years old, and we heard had just been licenced for a further 5 years). Despite all this, I saw many signs of improvement in Murmansk and the rest of the Kola region, at least socially and economically. Living standards have visibly improved, (at least in Murmansk) and much of the Soviet-era service style has been replaced with western-style shops and restaurants. I'm not saying Russia's entry into the world of globalized western capitalism is inherently a good thing, but it is a demonstration of improvements in some areas. There are still huge economic disparities, and I know the Columbia Sportswear and MEXX shops in downtown Murmansk are beyond the budgets of most of its citizens, but they were but the top end of a general trend throughout the city that indicates a growing middle-class. This situation, however, was tempered by towns like Lovozero and Umba where there is literally no main industry (save for Lovozero's Swedish-owned reindeer slaughter house, which operates less than half the year) and most people survive by basic subsistence. Posted on October 15, 2004 by Scott Forrest and filed under Academic, North, Travel. Posted on September 29, 2004 by Scott Forrest and filed under Academic.